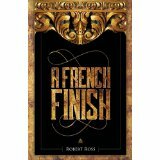 Life Imitates Art: In “A FRENCH FINISH” by Robert Ross, a quirky crew of Harvard art historians re-creates a ‘fake’ Louis XVI desk and pass it off as the real thing. 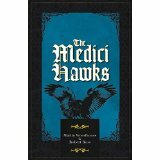 My father wrote this award-winning mystery-adventure and it was a hit back in 1978 and is a wonderful yarn now available at Kindle! 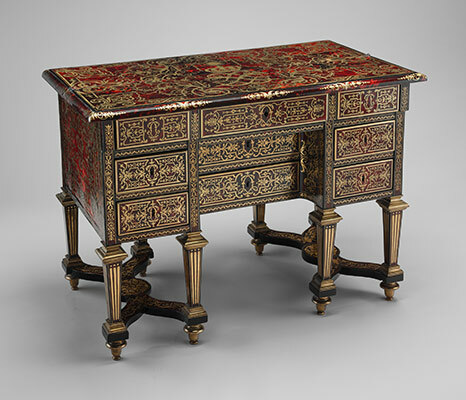 Here, below, is the latest news about another such royal desk built for the Sun King, Louis XIV. This extremely rare work is one of the very few pieces of furniture commissioned for Louis XIV’s use at Versailles. The folding-top desk, delivered in 1685, is made of oak and veneered with ebony and Brazilian rosewood. It is the work of Alexandre-Jean Oppenordt, the king’s ordinary cabinetmaker, and designer Jean Bérain the Elder, whose lively arabesques are particularly recognizable. 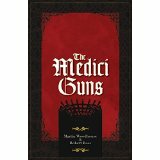 Each volume of this best-selling trio may be purchased on KINDLE. 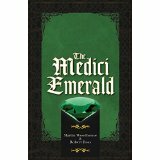 This entry was posted in A French Finish, Books, France, French History, King Louis XIV, Louis XVI, Mystery series, Robert Ross, The Medici Emerald, The Medici Guns, The Medici Hawks, Uncategorized and tagged #KINDLE, A FRENCH FINISH at Kindle. Bookmark the permalink.